Artist rendition of the Inmarsat 5 satellite, part of the Global Xpress fleet. 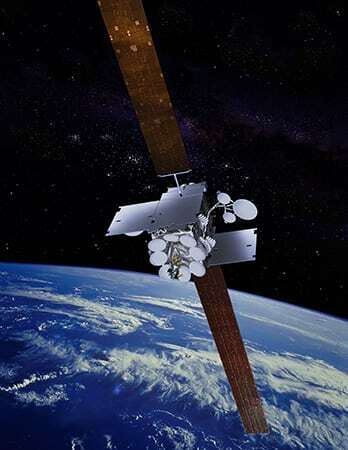 [Via Satellite 10-16-13] Inmarsat has selected Kratos Defense & Security Solutions’ subsidiary SAT Corporation to provide its carrier monitoring and interference detection system, Monics to the Global Xpress satellite fleet. Monics, an enterprise-networked DSP spectrum measurement and interference analysis system, combines hardware and software components to monitor satellite uplink and downlink performance, enabling operators to provide the best signal quality for their customers. Monics’ native scalability and flexibility enables a fully distributed, autonomous system for monitoring payload traffic against costly RF interference, including co-channel interference. Inmarsat Global Xpress (GX) will offer global coverage, consistent higher performance of up to 50Mbps, and network reliability. GX is the first satellite fleet from Inmarsat that will access Ka-band frequencies and allow for even higher bandwidth communication. The first satellite (I-5 F1) will cover Europe, the Middle-East, Africa and Asia. Full global coverage from the GX constellation is expected by the end of 2014.